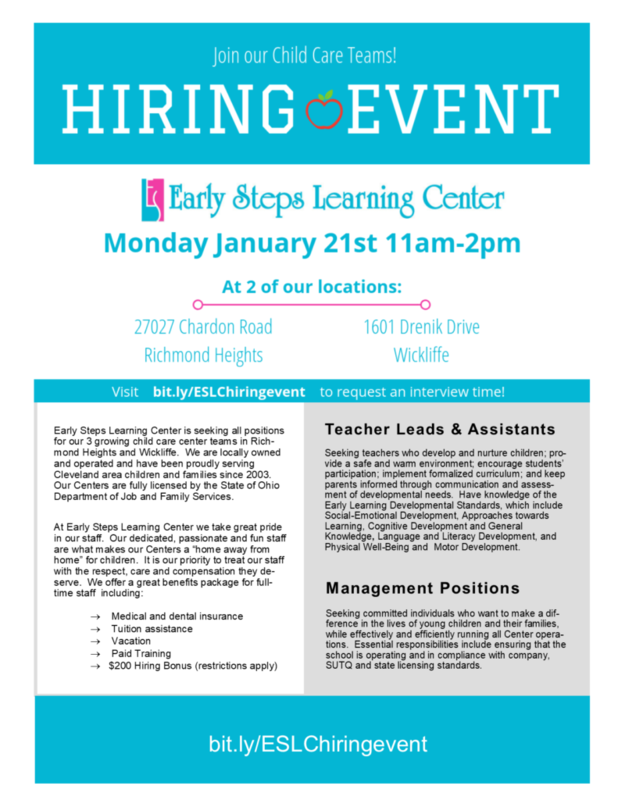 Join us at our next child care center Hiring Event! Children’s Christian Club is BACK! Early Steps Learning Centers are nurturing child care centers with exceptional education programs taught by qualified staff with a passion for fun. We are locally owned and operated and have been proudly serving Cleveland area children and families since 2003. Our 3 locations in Richmond Heights and Wickliffe on the East Side of Cleveland, Ohio care for children 6 weeks through 12 years old, 12 hours a day, Monday through Friday. Visit Us and learn why "Every Day is a Fun Day" at Early Steps Learning Center! Copyright Early Steps Learning Center 2018. All rights reserved.